Containing organic Aloe Vera and a combination of powerful exfoliants the Philip Kingsley Exfoliating Scalp Mask helps to minimize flaking, whilst soothing the scalp. Philip Kingsley Exfoliating Scalp Mask effectively removes dead skins cells, counteracting the build up of dry flaky skin. 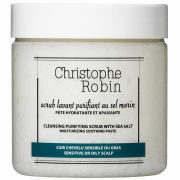 The mask can be used on all hair types to nourish, soothe and condition scalp and hair.